Sanky cactus fruit is small to medium in size, averaging 10-12 centimeters in diameter, and is round to oval in shape. 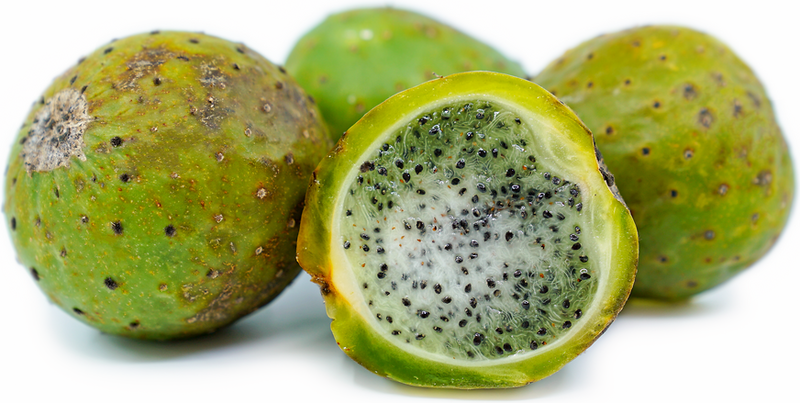 The rind is firm, green with some brown markings, and smooth at the surface with many thin, long spines that extend around the entire fruit. Underneath the rind, the juicy pulp is clear to white and contains many small black seeds. Sanky cactus fruit has a mucilaginous, crunchy texture and contains a low amount of sugar creating an acidic, tart, and slightly sour taste. Sanky cactus fruit is available in the summer through fall. Sanky cactus fruit, botanically classified as Corryocactus brevistylus, grows on a fast-growing shrub with long stems that can reach over six meters in height and belongs to the Cactaceae family. Also known as Zanki, Quitahambre, Sankay, Lemon cactus fruit, and Guacalla, Sanky cactus fruit grows on the wild Sancayo cactus and can be found along the rocky mountain slopes of the Andes in Peru and Bolivia. Once used by the Incas, Sanky cactus fruit is an ancient fruit that is still consumed today in South America and is favored for fresh eating. Sanky cactus fruit contains vitamin C, potassium, calcium, phosphorus, and some electrolytes. Sanky cactus fruit is best suited for both raw and cooked applications such as boiling and simmering. Most often consumed fresh, Sanky cactus fruit can be sliced in half and sprinkled with sugar to help soften the tart flavor. It is also commonly juiced and mixed with honey and water to create a sanky-ade, steeped into hot drinks, mixed with other fruit juices, pureed into smoothies, blended into cocktails, or stirred into porridge. In addition to drinks and fresh eating, Sanky cactus fruit can be cooked into jellies and jams. It is important to note that the fruit is covered in long spines. When the fruit is ripe, the spines can be removed with ease, but care and research should be taken prior to handling the fruit. Sanky cactus fruit pairs well with fruit juices such as coconut, pineapple, mango, lemon, lime, and melon. The fruits will keep 1-2 weeks when stored in the refrigerator. Sanky cactus fruit was used by the Incas as a hunger suppressant, replenisher, and medicinal aid to reduce problems associated with the gastrointestinal tract. Legend has it that the fruit was juiced and used by Incan traveling messengers to keep them sustained and hydrated for long distances. These legends also reveal that Incan shepherds would consume the fruit to survive warm temperatures and to reduce pangs of hunger to be able to work for longer periods of time. Despite the fruit’s popularity during the Inca empire, Sanky fell out of favor as the public view shifted to the fruit being a poor man’s food. In the early 2000s, chefs in Peru began a campaign to raise awareness of the native fruit to inspire locals to consume food available from their surroundings. Sanky cactus fruits are native to Bolivia, Southern Peru, and northern Chile, and have been growing wild since ancient times. Today the fruits are still found growing on the Sancayo cactus along the mountainous slopes of the Andes, but the cacti are localized to specific regions, making them somewhat rare. Once harvested, the fruits can be found at fresh local markets in Peru, Chile, and Bolivia.